Obituary for Mary E. Reynolds | L.E. 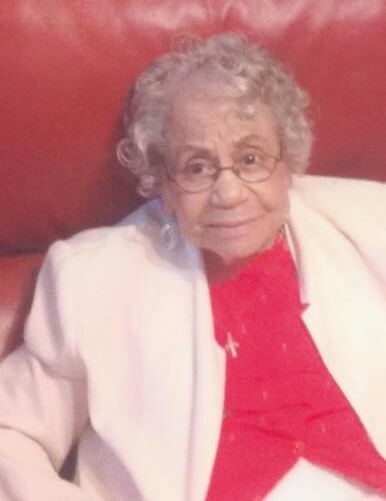 Black, Phillips & Holden Funeral Home Inc.
Service will be 11:00 a.m. Friday, February 8, 2019 at the New Bethel Baptist Church for Mrs. Mary Elizabeth Graham Edwards Reynolds who entered into the eternal Joy of the Lord on Thursday, January 31, 2019. Mary was born January 3, 1917 In Memphis, Tennessee to Frank Graham and Elizabeth Borkin Graham and was the youngest of four siblings. Mary was married to the late Rev. James Edwards. She later married the late Mr. Ensco Reynolds. Mary in her youth, became a member of Eastern Star Baptist Church in Memphis, then Pastored by the late Rev. Fields. Following the passing of her mother, Mary’s father relocated his family to Youngstown, Ohio and in 1922 they united with Tabernacle Baptist Church under the late Dr. S.P. Phillips (Mary’s Sunday school Teacher), the late Dr. H.J. Pippins and Dr. N.G. Harris. In later years, Mary became a member of Faith Temple Baptist Church pastored by Rev. Walter Gillespie. Mary served faithfully in various ministries of the churches she attended throughout her life. She was an ordained Deaconess, and an ordained Mother of the Church. Mary united with New Bethel Baptist Church, Rev. Kenneth L. Simon, Pastor, on March 3, 2015. She dedicated her life to serving God, His Church, and others and her faithfulness was rewarded with good health and longevity. Mary attended and graduated from the Youngstown Public Schools and was employed by and was a lifetime “Pioneer” member of the Ohio Bell Telephone Company (dba AT&T) until her retirement. She was an honorary Life member of the Communications Workers of America and was a member of and volunteer for St. Jude Home. Mary leaves to cherish her memory and mourn her loss, her caregivers, nephew and niece, Henry (Diane) Graham; nieces, Victoria Morris and Roberta (Richard) Carswell, Norris Lake (Jinney) Lindsey;enry H and a multitude of nieces and nephews to the 5th generation. Mary was proceeded in death by her grandparents; parents; her spouses; a niece, Thelma Graham-Bevly; nephew, Frank Graham; and her siblings, Edgar (Thelma) Graham, Robert (Grace) Graham, and Josephine (Rev. William L.) Lindsey. The family humbly thanks the administrators and dedicated, caring staff of Austinwoods for the excellent care provided to Mary during her residency at their facility, as well as the caregivers from Hospice for providing additional comfort care. Visitation will be Friday from 10:00 – 11:00 a.m. at the church. Arrangements entrusted to the L. E. Black, Phillips & Holden Funeral Home.